Vacationing like a superstar has never looked so good—or been so easy. Many celebs spare no expense when it comes to designing their homes (or backyards), so it’s not surprising that they expect the best on vacation, too. However, what does come as a shock is how many A-List celebrities are also big fans of Airbnb. And this gives us the opportunity to ogle their awesome rentals—and maybe even book the same spots for ourselves. Of course, these aren’t just any old rentals. These are some of the best properties Airbnb has to offer (think indoor movie theaters, Japanese-style bathhouses, and private beaches). To give you a better idea, here are 12 of the dreamiest, celeb-approved rentals. 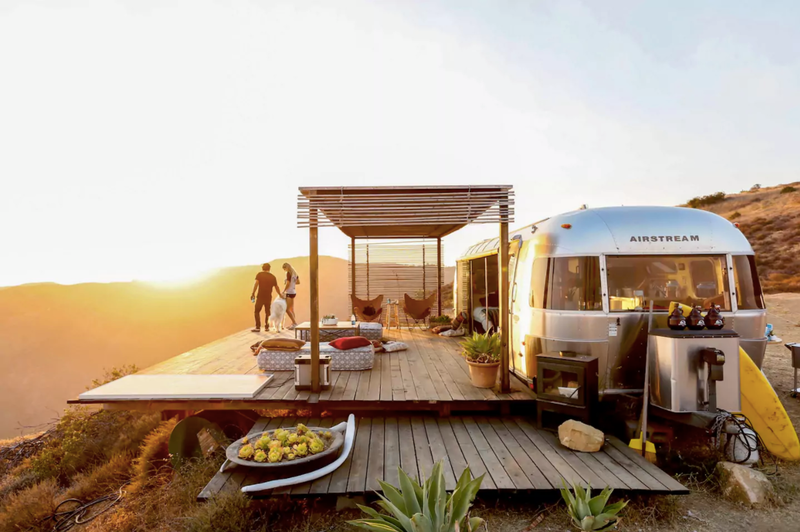 From a luxury estate in Honolulu to an airstream trailer perched above the Pacific Ocean, this is how you Airbnb like a star. Considering all Rihanna does is work, work, work, it’s no surprise she wants to play just as hard on vacation. Case in point: After recording her hit single “Work,” the singer booked a week-long stay at Paul Mitchell’s estate—yes, that Paul Mitchell—in Kailua, Hawaii. For just $6,000 a night, renters can enjoy some of the finer things the property has to offer including a Japanese bathhouse, saltwater lagoon, personal concierge service, and, of course, eight bathrooms fully stocked with Paul Mitchell products. Who knew an old school silver bullet could look so chic? Taylor Swift and Karlie Kloss, obviously. For their legendary Vogue cover shoot, the BFFs went straight to Big Sur and more specifically, The Malibu Dream Airstream, which sits on a private bluff overlooking the canyons and offers everything a normal rental would: two bathrooms, a queen-sized bed, and a kitchenette for just $500 a night. Whether you’re hoping to live like a Kardashian for a few days or just looking for a extravagant place to stay in Miami, Airbnb has you covered. For $1,259 per night, you can rent the swanky beachfront penthouse on Ocean Drive where the sisters stayed while filming Kourtney and Khloe Take Miami—including the gourmet kitchen, 24/7 concierge, and private rooftop pool. Although the “Contemporary Masterpiece” Beyoncé stayed at after her legendary Super Bowl halftime performance is technically an Airbnb, at $30,000 a night it’s anything but typical. But let’s be real: It’s Queen Bey, and the palatial pad has everything from an indoor gym and game room to an infinity-edge pool. No wonder she (and later Justin Bieber) decided it was a worthy rental. When a powerhouse performer like Selena Gomez needs to unwind, she rents out an Airbnb for a staycation. To rest up for her Revival Tour, the singer-actress scooped up this insane $2,999 per night rental—complete with a sprawling patio deck on a totally private beach—in Malibu. Rumor has it, when Oscar-winning actress Emma Stone was in Hawaii for a few weeks filming Aloha, she requested to be put up in an Airbnb instead of typical hotel. What she got was the Diamond Head Villa, a luxury resort with four bedrooms, a gourmet kitchen, indoor movie theater, heated pool, and panoramic views of the ocean. No wonder this stunning rental will set you back $4,000 a night. Britney Spears is no stranger to a stellar Airbnb stay. In addition to the $30M rental in Malibu she stayed at last summer, she spent Valentine’s Day snuggled up with her three favorite boys at a Mediterranean-style mansion known as the Malibu Dream Escape. Along with a private chef, bar, and infinity pool, they enjoyed private beach access and 360-degree views of the Pacific Ocean—all courtesy of Airbnb. Leave it to Drake to Airbnb like a baller. Instead of staying in a five-star hotel in Palm Springs for this year’s Coachella, he decided to rent out a $10,000 a night mansion in Beverly Hills. Complete with six bedrooms, seven bathrooms, a game room, grand piano, wine bar, and a loggia the size of Toronto, Champagne Papi got it poppin’ with the whole team in style (and even remembered to send a thank you note to Airbnb). Make no mistake about it: Mariah Carey loves a good Airbnb. In addition to the $22M estate in Aspen she rented for Christmas and a $10,000 a day beach house in Malibu, the songstress stayed in a $60M mansion on Lake Como while vacationing in Italy last spring. The 18th century mansion—once home to opera composer Vincenzo Bellini—is decked out in ceiling frescoes, chandeliers, fountains, marble floors, and queen-sized bathrooms; perfectly suited for a diva like Carey. Leave it to supermodel Karlie Kloss to make our list of superior Airbnb stays twice. For a weeklong trip to Los Angeles last year, the site offered her a modern $10M villa—with five bedrooms, five bathrooms, multiple dining and livings spaces, and a sparkling swimming pool—in West Hollywood completely free of charge. However, the place is all yours for $1,650 a night. Located just twenty minutes away from Palm Springs, the resort city of Rancho Mirage has long been a popular celebrity hideout. So it’s no surprise that during a recent trip to Coachella, Joe Jonas opted to hole up in Bing Crosby’s old estate. Along with five bedrooms, a gourmet kitchen, and an indoor screening room, the mansion features fire pits, putting greens, and a private pool for throwing an epic after party. Who better than fashionista Olivia Palermo to show us the stylish way to stay in the Hamptons? She spent the last weekend of summer relaxing in a super chic, $1,100 per night house in Sag Harbor—complete with four bedrooms, four bathrooms, viewing decks, a covered patio, and a massive swimming pool (perfect for escaping the scorching New York City summer heat).